The outgoing Head of Sri Lanka Monitoring Mission Major General Ulf Henricsson and the newly appointed Acting Head of Mission, Major General Lars Johan Sølvberg, met Liberation Tigers Political Head Mr. S. P. Thamilchelvan in Kilinochchi Friday evening. Mr. Thamilchelvan, on behalf of the LTTE leadership, thanked Maj. Gen. Ulf Henricsson for his courageous and determined efforts, at the risk of his own safety, to resolve the Maavilaru dispute and thanked the truce monitors of Nordic EU Member States for their "four and a half year profound service." "It is unfortunate that the engagement of Nordic EU Member States was affected as a principled consequence, following the EU decision to enlist our liberation movement in the list of proscribed organisations," Mr. Thamilchelvan told TamilNet after his meeting with the SLMM leaders. Thamilchelvan charged Colombo for the disinformation campaign and propaganda with the ultimate aim of proscribing the Tigers. The Nordic EU Member State staff from the SLMM from Kilinochchi Liason Office (LO) were also present at the meeting that began at 4:00 p.m. and lasted for one hour, LTTE sources said. "One of the immediate and basic objectives of the Ceasefire Agreement was to restore normalcy to war affected Internally Displaced People," Mr. Thamilchelvan said. "Then, the 2004 December Tsunami devastated the lives of the people along the coastal belt of the NorthEast. 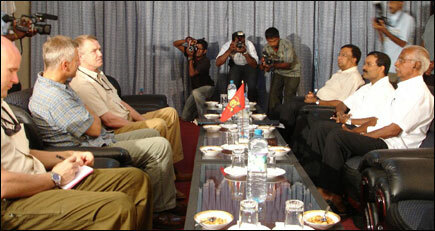 The efforts by the Internationally mediated reconstruction and relief arrangements were scuttled by Colombo," he said. "And now, Colombo is sending it's Kfir bombers, almost on a daily basis, targetting the civilians along the coast of our homeland. As a result, thousands of war and tsunami affected civilians are forced to flee." "We will not allow this to continue. There is a limit," he said. Mr. Thamilchelvan honoured the Nordic EU Member state monitors with memorial gifts on behalf of the LTTE leadership.